San Diego, CA – May 31, 2018 – BridgeWave Communications, a leader in next-generation wireless backhaul systems, today announced that its Flex4G-10000 system, which delivers true fiber performance, was selected and deployed by Believe Broadband, a leading Maryland-based Internet service provider (ISP), to support high-speed Internet connectivity at Pimlico Race Course for over 134,000 racing enthusiasts on hand for the 2018 Preakness Stakes. 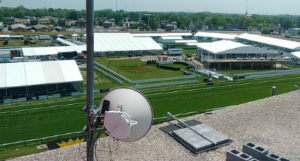 Media and attendees were able to share their experiences over the Internet without delay – including HD video of the Preakness Stakes itself – which was won by Justify in an exciting finish. BridgeWave systems provide a fast, easy, and inexpensive way to extend backhaul networks without the cost, time, and complexity of new or leased fiber. BridgeWave multi-Gigabit millimeter wave (80GHz) radio systems deliver fiber capacity, 256-bit AES encryption for highest data security, and the highest system gain to ensure maximum throughput at the longest distances. In addition to our flagship system, the Flex4G-10000, BridgeWave offers the Flex4G-LITE, delivering up to 3Gbps, and the entry-level Flex4G-1000, delivering up to 1Gbps.